Today marks the start of national Children’s Book Week: the annual celebration of reading for pleasure for children of primary school age that has been running for the past 80 years. Running from 1st-7th October, the theme of this year’s celebrations will be ‘Heroes and Heroines’. The BookTrust website has this introduction to the festivities, which explains how teachers, librarians, parents and others can get involved. One perfect way of celebrating Children’s Book Week yourself is by reading aloud with a child or young person that you care for: and what better book to do this with than A Little, Aloud for Children?! The Reader Organisation’s latest publication is a collection of some of the greatest children’s literature from past to present, carefully selected for its success in being read aloud with young readers. If you wanted to get into this years’ book week theme, there’s plenty of great choices to be found in the book: from Tom Sawyer and Toad of Toad Hall, to Ruby and Garland from Jacqueline Wilson’s Double Act, the anthology is filled with literary heroes and heroines of every description! 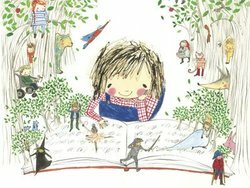 The Reader Organisation’s promotion of reading with children and young people goes beyong this week, however, and if you want to join-in with the reading aloud fun beyond Children’s Book Week, why not come along to the Family Reading Day that is part of the Manchester Literary Festival this year? On Sunday 21st October, staff from The Reader Organisation will be setting-up shop in the Market Place of the Manchester Town Hall Reception Room for a day of live interactive readings from A Little, Aloud for Children and discussions about reading for pleasure with young people. You can find out about this and all the other exciting events taking place on the day on the MLF website. Hope to see you there!